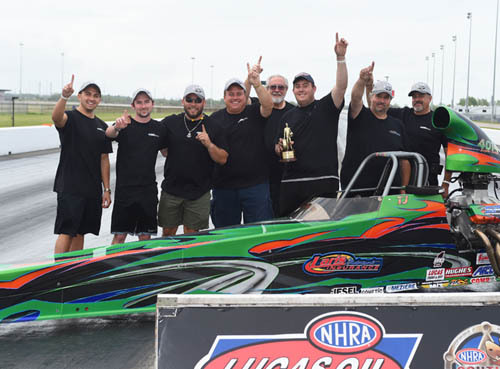 NHRA Texas Sportsman Challenge winners. BAYTOWN, Texas --Keith Mawhee (Competition Eliminator), Aaron Stanfield (Super Stock), Jimmy Hidalgo Jr. (Stock), Trene Cressonie (Super Comp), Val Harmon (Super Gas), Rick Huffman (Super Street), J.R Baxter (Top Dragster), Lance Rutland (Top Sportsman) and Patrick Roetto (Sportsman Motorcycle) took home the wins from the NHRA Texas Sportsman Challenge. Keith Mawhee and crew celebrate win. 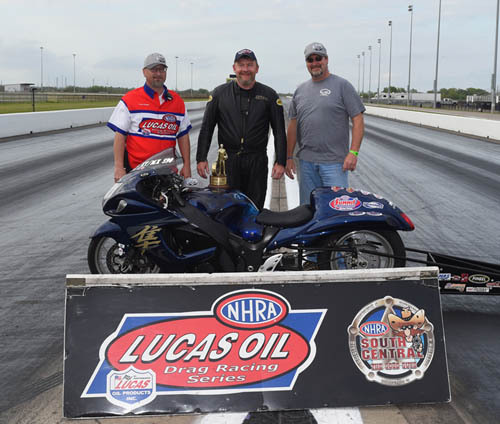 Keith Mawhee won his fourth Lucas Oil Drag Racing Series Wally and first in Comp Eliminator. He had a great light in round one on a single when Scott Cashio was a no show. He defeated Justin Hutto and Keith Hall in round two and three before getting a bye in the semifinal. 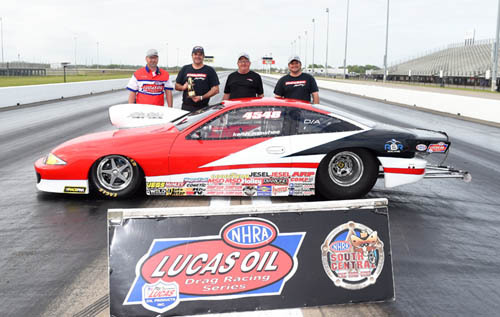 In the final Craig Bourgeois went red to give Mawhee the win in his D/A 2015 Cavalier. Aaron Stanfield and crew celebrate win. Jimmy Hidalgo Jr. and crew celebrate win. 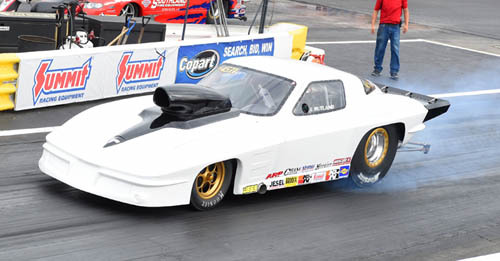 Jimmy Hidalgo Jr. took home the Stock Wally winning his 13th Lucas Oil Drag Racing Series Wally and 12th in Stock. 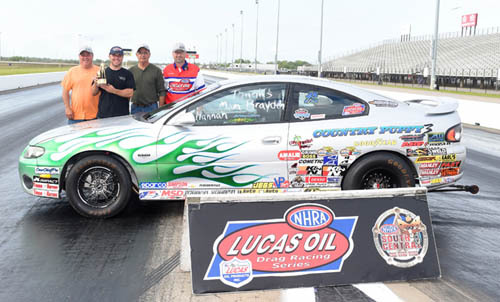 He defeated Bob Sharp, Justin Hutto, Bryce Granier, Kent LaPorte and Gary Emmons on his way to the final. In the final Mike Trumble went red to give Hidalgo Jr. the win. Trene Cressonie and crew celebrate win. Trene Cressonie defeated Kyle Rickman, Justin Frost, Justin Frost and Bradford Core in the first four rounds. In round five he got the bye, in the semifinal he had a great light to defeat Todd Erwin. He got the starting line advsntage in the final to defeat Cole Cummings. 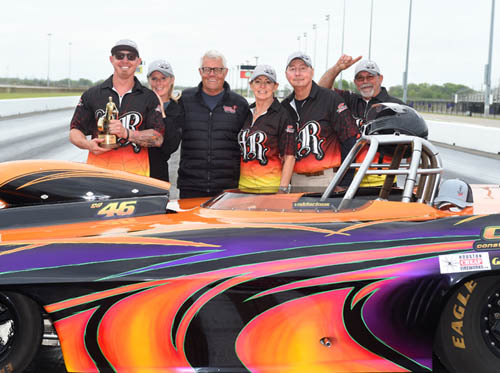 He won his third Lucas Oil Drag Racing Series Wally and second at Baytown. Val Harmon and crew celebrate win. Val Harmon won his 11th Lucas Oil Drag Racing Series Wally, his third in Super Gas including here last year. 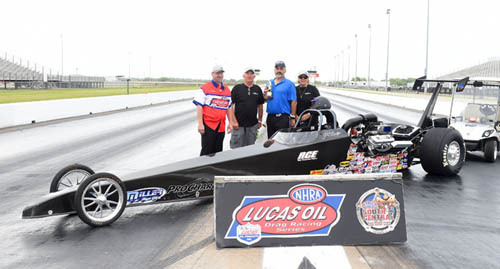 This was his third win at Houston Raceway Park powered by Pennzoil. He defeated Jesse Pollard, Charles Pence, Jim Rod Capp and Travis Salter in the first four rounds. In the semifinal Steve Collier went red to give Harmon the win as he advanced to his 12th final round. 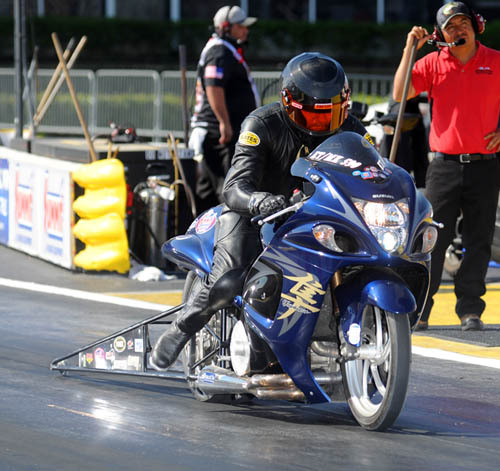 In the final he had a great light to defeat Justin Allen to win back-to-back Super Gas titles at the NHRA Texas Sportsman Challenge. Rick Huffman and crew celebrate win. In round one and two Val Harmon and Bryan Sandlin went red to give Huffman the win. In the third and fourth rounds he had identical great lights (0.005 seconds) to defeat Christopher Presley and Paul Martinez. In the semifinal Huffman had a great light (0.002 seconds) and package (0.010 seconds) for the win over Chris Haralson. In the final he had another great light (0.005 seconds) to defeat Jason Owens. 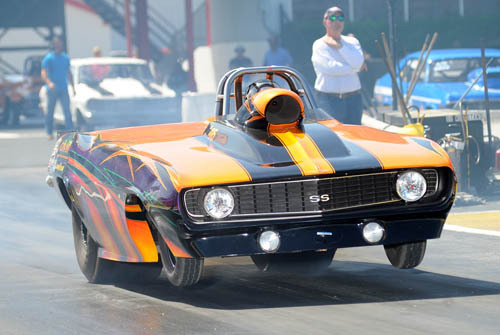 Huffman won his second Lucas Oil Drag Racing Series Wally and first in Super Street. J.R. Baxter and crew celebrate win. J.R. Baxter defeated Wynette Hudgins, Mario Boesch and David Johns in the first three rounds. The semifinal was a great drag race as Baxter got the starting line advantage and the win in a close win over Jon Bradford (margin of victory 0.0030 seconds approximately one foot). 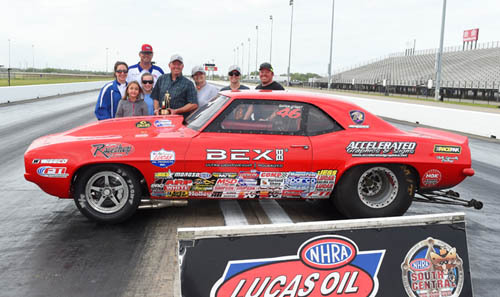 In the final he defeat Aaron Stanfield when he had problems right off the starting line to give Baxter his fourth Lucas Oil Drag Racing Series Wally. Lance Rutland and crew celebrate win. Lance Rutland defeated Trent Wilson, Daniel Leibham and Bob Gulitti in the first three rounds. In the semifinal he got a bye into his fourth career final. Rutland with the starting line advantage in the final to defeat Cole Prejean. 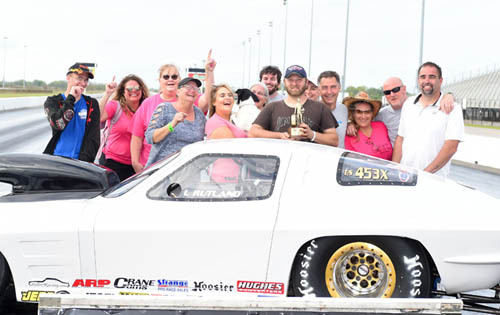 Rutland won his third Lucas Oil Drag Racing Series Wally in his second in Top Sportsman. Patrick Roetto and crew celebrate win. Patrick Roetto defeated Charles Dupard Jr. and Brenda Kay in the first two rounds. In round three he got a bye into the semifinal where Tony Davis went red to give Roetto the win. Roetto defeated Cody Couch in the final when he went red. 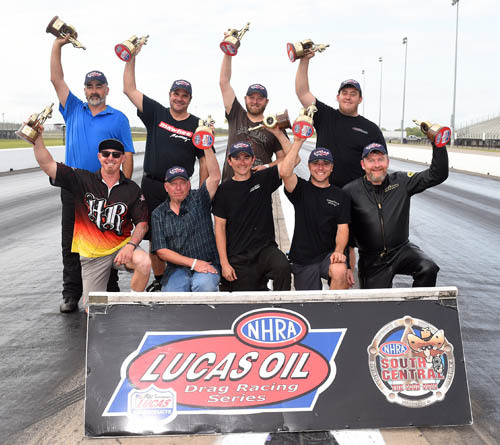 The following are Sunday's final results from the NHRA Lucas Oil Drag Racing Series, South Central Division NHRA Texas Sportsman Challenge. Keith Mawhee, Carrollton, Texas, '15 Cavalier, D/A, 7.892, 143.67 def. Craig Bourgeois, Metarie, La., '05 dragster, A/ND, foul. Aaron Stanfield, Bossier City, La., '87 Camaro, GT/IA, 9.653, 131.96 def. 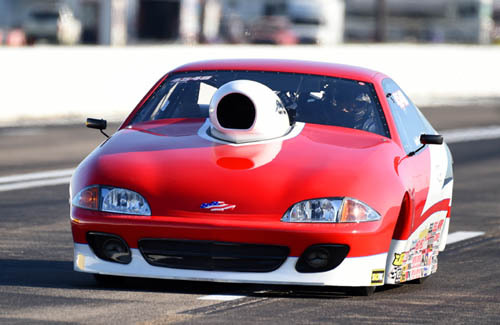 Brett Candies, Thibodaux, La., '10 Cobra Jet, FGT/F, 9.362, 144.83. 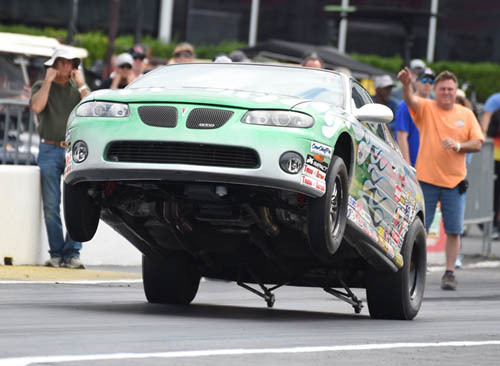 Jimmy Hidalgo Jr., Donaldsonville, La., '04 GTO, E/SA, 10.979, 98.71 def. Mike Trumble, Pasadena, Texas, '71 Chevelle, D/SA, foul. Trene Cressonie, Raceland, La., '06 Mullis, 8.887, 170.73 def. Cole Cummings, Hammond, La., '11 Phantam, 8.883, 168.28. 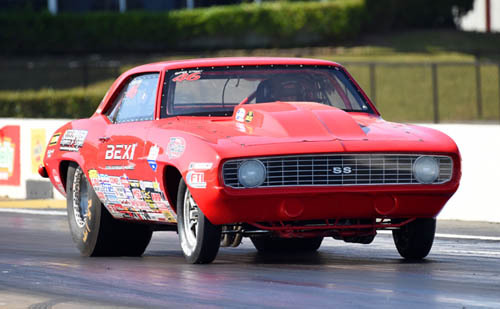 Val Harmon, Boutte, La., '69 Camaro, 9.876, 162.41 def. Justin Allen, Mansfield, Texas, '08 Don Davis, 9.808, 163.59. Rick Huffman, Burleson, Texas, '69 Camaro, 10.939, 144.33 def. Jason Owens, White Oak, Texas, '68 Camaro, 10.997, 131.34. J.R. Baxter, Waxahachie, Texas, '16 Miller, 6.378, 176.24 def. Aaron Stanfield, Bossier, La., '17 Miller, broke. Lance Rutland, Spring, Texas, '63 Corvette, 7.555, 180.91 def. Cole Prejean, Saint Amant, La., '99 , 7.851, 188.99. Patrick Roetto, Wichita, Kan., dragster, 8.611, 155.08 def. Cody Couch, Cypress, Texas, '08 Suzuki, foul. Photos in this story and all photos from this event plus all Division Four races can be purchased by emailing Robert Grice at rgcal2017@gmail.com.